Finishing the course 1 day earlier and getting back to school the next day. Can you imagine Friday speaking on how the school system is one of the harshest oppression tools that regime has invented to manage the crowd and Saturday go to my school to start “My very directed teaching process” which makes me back in control of everything, how students will ask and what will they ask and what will they learn and how will they learn it. And ironically I do it in an environment which will convince them that they are the ones who choose to learn this thing (as of course I am the electives teacher). For more than five working days now I just can’t create a lesson plan (although I am very good at it). 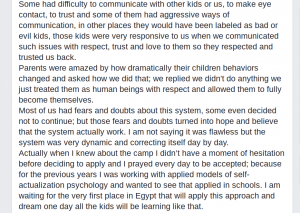 And I am so de-motivated to the process of working as a teacher, as the fact of being that hypocrite actor, teaching students for a whole year things, based on “American common core standards” which totally doesn’t fit in Egypt, is very depressing and makes me feels that I am wasting both my time and my student’s time as well. The other part of my struggle is my son Seif in particular. I used to be that OK with him being at school on different aspects. The first was developing his social skills, and learning how to be interactive with others and communicate. And after three years of schooling this part has happened; but he lost his spontaneousty, and transformed to a very stressed out kid. What happened at Seekem actually elevated the part of his stress, and created a new space between me and him, sharing interests, walking together, exploring new things together. Leaving him on his own while me just watching the magic happens. But we will be back to school in two weeks unfortunately. And the thing is I don’t want him to get stressed out again (which will happen naturally on his first day of school). I wish he can sustain his eagerness to learn new things on his own. I wish his spontaneousty to come back again, having more time with him to enjoy and play more. And also I want all of this to happen in a safe community of learners not in my house. When I talked even with my husband about my struggle and that I am thinking to try other options than the school, of course we went to the replacement issue, so I told him what do you think. He introduced a place looks like Agile Learning Centers, but in his words “this is if I have enough money and resources and other believers who are willing to do the same thing with their kids”. He called it the idealistic model answer for the fact of schooling is not that ok. And till we can find this Utopia school is the best option so far. I didn’t buy because I know more about school than he knows. I know that at school no actual learning is happening, how we all lose our cultures, language, history and heritage, to fit in the “Career Market”. And at the very end they lose their minds and they won’t fit in the market. The struggle now is massive and aggressive, and I don’t know how will I end it up. In the summer of 2016, in partnership with Agile Learning Centers, I conducted a 12 day training for facilitators on self-directed and agile education. Below is a combination of the documentations and testimonials participants created during and post the experience. I see these pieces and videos as the best and closest capture of the experience. It is seen through the eyes of the people who lived it. Participants had the freedom to blog in whichever way suitable to them. Some wrote their thoughts on their Facebook accounts, some posted it here on the website and others video blogged. I hope you enjoy the read and get a feel of what this experience is about – although it is never like living it! 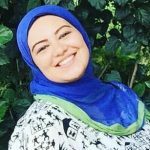 Aya Ashour is a children’s facilitator and a math teacher. She works to link Math to life applications and body movements. She is also a writer and a blogger. Aya documented the 9 days she attended as part of the training program in 4 pieces of writing. Her blog posts, a beautiful documentation of her daily lived experience in the program, insights, questions and confusions all come in fresh from her eyes. Documented in the Arabic language on the Zedny website, an Arab education news network: here (part 1), here (part 2), here (part 3) and she concludes it all here (part 4). Noha Zahra is a director and a chairwoman of AlResala Language School, a private national school. She has more than 10 years of experience in the education sector from management to pedagogy. For this program to come to life, Noha opened to us, organizers and facilitators, the doors of her school and offered all the possible facilities pro-bono. It wouldn’t have happened without her. She created some video blogs live during the training program. One of them is on the importance of failure, a concept that lit for her during the program. In a mix of English and Arabic, you can find this video blog here. Another one minute video blog here documenting a new insight she learned through one of the program days (also a mix of English and Arabic). Heba Zayed is a neurosemantics and a self-actualization coach and trainer. She deals with different audiences including parents to coach them to leave their fears behind and trust their children. 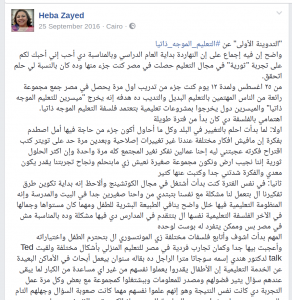 Heba wrote a few reflections on her personal Facebook account. You can find screen shots of these reflections below English and Arabic. Amira Saad is one of the program organizers. 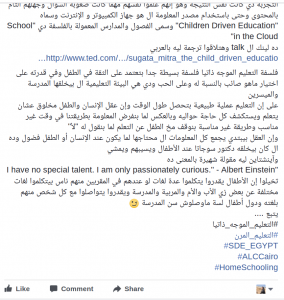 She is a homeschooling mother, a Montessori teacher and trainer, the founder of a parents skills development center in Egypt and an Arab region social media influencer when it comes to parenting and alternative education. She decided to capture her share in the form of a video blog that documents her own insights and that of many of the program participants too. You can meet all participants virtually and see the summary of their insights and voices in this video blog in Arabic here. Shaimaa Al-Sharif is a positive parenting trainer. She is a mother and an explorer of new forms of education for her child who is now fed up of traditional schooling. She documents the first two days of the experience in meticulous details that we, facilitators, cannot do as such. She shared her two pieces of documentations in the forms of notes with us here on this website blog. – انت مش هتقدر تتعلم تاخد قرار كويس لو ما اتسمحلكش تاخد قراراتك اصلاً. – الأطفال بتتعلم احسن لو بيعملوا حاجه ممتعه بالنسبالهم، وهنا سأل Eric وقال اللي اتعلم حاجه قبل كده فى وقت اسرع علشان بيحب الحاجه اللى بيتعلمها يرفع ايده، ومعظم الحضور رفعوا ايدهم. حتى لما كان فيه واحده اتعلمت حاجه بسرعه وهى مش بتحبها كان ردها انها عاوزاها علشان هتخدم شغفها فبرضه الدافع والمتعه فى الآخر موجوده. -الأطفال دايماً بيختاروا احنا بس اللى بنحدد اختياراتهم يا اما تسمع اللى اتقالك او هتقع فى مشاكل فيه منهم هيكتشف انه عنده اختيار تانى: هيوافقك فى اللى اتقاله وبعد كده هيحاول مايتمسكش وهو بيعمل الحاجه التانيه اللى هو عاوزها. ومش ده اللى احنا عاوزين اطفالنا يتعلموه ولا يعيشوه. – الأطفال لما هيمارسوا انهم اصحاب القرار في اللى بيعملوه هيتعلموا درجه عاليه جداً من المسئوليه وده إحنا مفتقدينه جداً. – احنا ما بنتعلمش السواقه بقراءة كتب عن السواقه ولا لما حد يحكيلنا ويشرحلنا هى بتم ازاى. بنتعلم لما نقعد على كرسى السواق ونزود خبرتنا كل مره نسوق فيها. – لما الأطفال يمارسوا اللي بيحبوه وهواياتهم ده بيخليهم متناغمين مع نفسهم ومتواصلين مع شخصيتهم الحقيقية ومع شغفهم وبيعرفوا بسهوله يميزوا هدفهم اللى ربنا خالقهم ليه فى الحياه. من الحاجات اللى اتعلمناها كمان إن التعليم باللاتينى جاى من فعل educare يعنى draw foce from within يعني من الداخل وده بيلغى فرضية اننا نحشي مناهج فى مخ الأطفال وندخلها. الصح اننا نخلق المساحه حواليهم اللى تخلى اللى جواهم واهتماماتهم وميولهم هى اللى تحركهم. من الجمل اللى علمت معايا جدا لما كان Eric بيوجهنا للطريقه اللى بنتعامل بيها مع الأولاد قال ان طريقتنا تبقي بتقديم كامل دعمنا باقل تدخل مننا Maximum support with minimal interference علشان خبرات الأولاد تزيد من محاولاتهم هم. ومن الحاجات اللى استغربتها جداً لما جت سيرة الألعاب الإلكترونية وضررها وعدم فايدتها وهنا اتخضيت من رد فعله Eric كان واقف جلس القرفصاء وقال بصوت مليان قوه انتوا بتهزروا، انتوا فاهمين شخصية الطفل اللي بيختار يلعب PlayStation ده طفل صلب ومستعد للتحديات. انا صراحة فتحت بقي ساعتها وبدأ نقاش قوى فى النقطه دى. وقال تعريف الألعاب الإلكترونيه unnecessary obstacles willingly overcome وقال ان الأطفال دى هى اللى اختارت انها تعمل حاجه فيها تحدى وان الألعاب دي لو ماكانش فيها صعوبات ومستويات يجب تخطيها وصعبه علي نوعية الأطفال المهتمه بالألعاب كانت هتبقى ممله بالنسبه لشخصياتهم. الطفل ده صلب وبيحب الحاجات اللى فيها تحديات. دى كانت اول مره اشوف الموضوع من وجهة النظر دي. دي مش وجهة نظر خارج الصندوق، ده نسف الصندوق أساساً بالنسبالي. ولما اتقاله ان فيه ابحاث بتقول انها مضره للمخ رده كان ان فيه ابحاث لكل حاجه، قال احنا حقيقة مانعرفش ومش متاكدين، وقال ان الحاجات الجديده دايما بتتعارض وان الآله الكاتبه لما اخترعوها قالوا انها هتقضى على الأدب وكذلك الكاميرا وقالوا نفس الكلام على التليفزيون والأفلام قالوا ان دى مفسده وانتقدوهم وعارضوا الفكره وقتها. قال فيه ابحاث علميه بتقول انك ماينفعش تاكلى لحوم وابحاث بتقول ان الأرض اتخلقت من 6000 سنه. وقال ان لما الكتابه بدات فى اليونان فيه فيلسوف مشهور قال ان ده هيدمر الإنسانيه. الفرق فى طريقة استخدامنا للوسائط الموجوده. ومعن ان الوسائط تتغير وتيجى حاجه جديده اننا بنتقدم ونتغير. مين قال ان tedx talks والأفلام الوثائقه مش مفيده. الفرق احنا بنستخدم الوسائط دى علشان نستفيد وللا نضيع وقت اكتر. من الحاجات اللى استغربتها برضه انه قال ان احسن اطفال عنده فى تحصيل العلم اطفال مطرودين من مدارس تانيه، واحد منهم مطرود من 5 مدارس وهو ساب مدرستين ولما جه فى النظام الموجه ذاتياً برع علشان حس بحرية الإختيار وعلشان هو شخصيته رافض ان حد يحطله حدود او حد يرسم له شخصيه مش شخصيته. وكمان قال ان الأطفال الحركيه اللى معظم المدارس بتشخصها بأمراض زي فرط الحركه وخلافه بتبقى اطفال عاديه بس النظام هو اللى ما احتواهاش وماقبلش غير انه يطلع مكن متشابه. وكمان قال ان احسن اطفال فى نظامنا التعليمى التقليدى الأطفال السمعيه اللى بتتلقى وبكده احنا مش بنعلم الأطفال الحسيه او البصريه بالطريقه المناسبه ليهم ومش هتبقى نجاحاتهم زي الاطفال السمعيين وده ظلم ليهم اننا ما احترمناش الفروق الفرديه. دى كانت الحلقه الثانية من التجربه البديعه دي والبقيه تأتى. من كام إسبوع حضرت كورس بيتكلم عن التعليم الموجه ذاتياً. 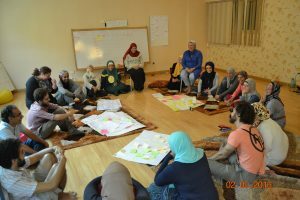 مبدئياً كده فى الأول هم كانوا 3 أيام علشان إحنا نتعلم نبقى ميسريين للعملية التعليميه facilitators اللى كان بيدير الكورس Eric امريكى وناريمان مصرية. اول القصيده كده كانت مختلفه تماما، كلنا نقف فى دايره ومجموعة العاب تحمس وتنشط وتلغى أي جبال تلج موجوده وتبيدها فى نص ساعه. منهم اننا نهيم فى الغرفه اللى قاعدين فيها فى المكان اللى نحس اننا عاوزين نروحله ونفضل نتحرك ونتعمد مانبصش فى عين أى حد وناريمان كانت بتوجهنا نفكر في ايه، وبعد كده طلبت نزود سرعة الحركة ونفكر فى المواصلات والزحمه والتاخير والحاجات الللى ورانا وبدأنا نهرول واكنها خلية نحل. ورجعنا مشينا بالراحه وطلبت نبص في عيون الناس واحنا بنتحرك. وبعد كده طلبت طلب كان صعب على معظم الحضور، إننا نشكل ازواج، كل اتنين يقفوا قدام بعض ونبص فى عنين بعض بدون ما ننطق كلمه ونتواصل ونعبر ونقرا اللى قدامنا بدون كلام. واتحركنا وكررنا وعملنا ال eye contact مع حد تانى. من ضمن الأدوات فى طريقة التعليم دى انهم لما كانوا بيلاقونا مش مركزين كان بيجمعوا تركيز الناس بالالعاب. لما كنا بنتكلم كذا حد فى نفس الوقت عندهم كذا لعبه علشان يضمنوا انها مش هتبقى هيصه. لما كانت الطاقه بتهبط اوى ومافيش حيل للشغل كانوا بالألعاب بيزودوا الهمه والنشاط. وكمان لما كانت بتبقى طاقه زياده فى لحظه محتاجه هدوء كانت بتشتغل تمارين التنفس وتأمل توصل للطاقه اللى محتاجينها فى اللحظه دى. إدارة 30 شخص فى غرفه مايعرفوش بعض لمدة 3 أيام بالثمن والتسع ساعات يعلموهم وكمان يخلوهم وهم بيتعلموا بيحضروا لمعسكر للاطفال هيتعمل لمدة 5 أيام بعدهم بالنسبالى كانت مستحيله بأى طريقه شفتها فى اى شركة من اللى اشتغلت فيهم. وباى طريقة ادارة اجتماعات شفتها وبعاداتنا المصريه اصلاً والكلام الكتير وكل واحد صح وغيره غلط وعدم احترام المواعيد وكله مدير وخلافه. اول يوم طلبوا نعمل قائمه ب نوايانا عن اليوم Intentions ودي بالنسبالى كانت نقطة نورlight bulb ونويت اعملها لباقى حياتى يوميا على قد ما اقدر (انما الأعمال بالنيات) ده الدين بتاعنا وواحد امريكى مش مسلم أصلا هو اللى بيعلمنا كده، اللى هو دى اول مره تتقال بالوضوح ده فى اى كورس اخدته. وبنرجع اخر النهار نشوف حققنا النوايا دى وللا لا ولو لا ممكن نأجلها لتانى يوم او مع المعرفه اللى بناخدها بتكون النوايا صغيره جدا جنب اللى اكتسبناه. ابتدى يفهمنا طريقة التعليم دي Eric وراح قال جمله هى أساس عملية التعليم الموجه ذاتياً، قال: trust the process وبلعبه برضه علمنا معناها خلانا فى مجموعات كل واحد يقول تعريفه لكلمة الثقه من وجهة نظره trust is. واللى مع اخر الكورس إتضح إنها سحر فعلاً فى انى اثق ان الشخص اللى ما اعرفهوش ده بمجرد ما اطلب منه حاجه يبقى هيعملها وواثقه في ان جزئيته اللى بتكمل جزئية باعملها هتطلع كويسه ومش لازم احط نفسي فى كل حاجه واعرفها، وده علشان لما هنشتغل مع الأولاد لازم نكون واثقين فيهم فعلا مش تمثيل. وان ادوارنا كلنا بتكمل بعض. ناريمان بقى لما لقيتنا مش عارفين نقرر بالمعلومات القليله اللى عندنا (من وجهة نظرنا برضه علشان واخدين على جو المحاضرات واننا متعودين يبقى معانا نظرى كتير ونكتتب ونجمع معلومات ننفذ تمنها قالت: you should really take decisions with minimal information. واننا مش لازم نعرف كل حاجه علشان نقرر، علشان ساعات هنواجه حاجات لازم ناخد فيها قرار وساعات كان بيبقى هتقول الحاجه اللى عاوزنها وتقول لا انا مصممه تاخدوا القرار بمعلومات قليله. اليوم بيبقى فيه أجزاء كتير جداً وsessions مختلفه فى نفس الوقت ومع هذا التشتت ناريمان علمتنا مصطلح جديد FOMO – Fear of missing out واننا عاوزين كل حاجه ومش عاوزين نضيع حاجه بس الحقيقيى اننا لازم نختار ايه الأهم وايه اللى نحضره والباقى نسال عليه اللى حضر ونشارك بعض المعلومات والخبرات اللى عرفناها. خلال اليوم فيه حاجات كتير بيستعيضوا عنها بحركه ده طبعا كان بيوفر وقت كتير. مثلاً لو اتشتتنا وخرجنا خارج الموضوع بيبقى فيه حركه بصباعنا بنلمس بين عيننينا ونقول focus نقطة تركيز ونغمض عنينا ونسكت لثوانى ونكمل. او لو هنغير حاجه يبقى بايدينا الإتنين نشكل مثلث delta sign وده معناه فيه تغيير فى المخطط او الكلام المتفق عليه. لما جه وقت الغذاء لقيت ناريمان بتقول مين يحب يشاركنا شكر لنعمة الطعام ودى بالنسبالى ماكنتش فكرت فيها بالطريقه دى قبل كده، بشوفهم فى الأفلام الأجنبيه بيعملوها بس احنا بناكل ونبلع ونقول الحمد لله بالتعود لدرجة انها بقت عاده بنعملها بدون ما نستشعرها وساعات بطلنا نعيها او حتى ساعات مش بنفتكر احنا قولناها وللا لا. وقت الغداء ناريمان ماطلبتش اننا ننضف مكانا ولا علقت ورقه صارمه باننا مانعكش ولا كل واحد هنا بيخدم نفسه ولا عملت اى حاجه من دى، هي سألت يا جماعه مين عنده استعداد يساعد بعد الأكل فى انه يلم معانا (واخدين بالكم من معانا دى) طبعاً ايادى كتير اتمدت والأكل والمطبخ اتلموا بمنتهى السهوله والود والتعاون. واللذيذ ان اللى مالموش محدش بصلهم بصه وحشه واللى لموا ماحدش ادالهم نيشان، كل واحد عايش اكنه فى بيته والناس اللى حواليه تقبلوه زى ماهو بسلاطته ببابا غنوجه بعيوبه وبجماله بضعفه وبقوته. اصلنا بصينا على ارواحنا فعلاً. والغريب فى الموضوع ايه بقى Eric من اول لحظه دخلت القاعه كان حافى وده خلى ناس كتير اخدت الخطوه دى وبقت على طبيعتها جدا جدا. فى النص واحنا شغالين نلاقيه اتشقلط ووقف وبيمشى على ايده. العفويه والمرونه والتلقائيه مع الإحترافيه دى خلت ال 30 فرد دول اكنهم يعرفوا بعض بقالهم فتره. محدش مكسوف من حد وماحدش خايف يتحكم عليه ومحدش حاسس انه بينتقد، كانت خلية نحل بمعنى الكلمه. من الكلمات اللى قالها Eric خليكم على طبيعتكم الولاد هتبقى على طبيعتها. لو رحتوا تتغدوا هم هيتغدوا. لو قولتلهم انا تعبان دلوقت هم هيعبروا كمان. لو استخدمتوا غرفة الراحه والهدوء Relaxation room هم هيستخدموها، ودى كانت غرفه اتعملت علشان فيه تعليقات جت من اهالى ان اولادها بتتوتر مع الصوت العالى فده كان اقتراح وليد اللحظه مش نمط ماشين عليه فى طريقة التعليم دى. انا مؤمنه من زمان بمبدأ ال synergy إن الطاقه الناتجه من مجموعة بتشتغل مع بعض اكبر من مجموع ناتج كل فرد لوحده. يعنى احنا ال30 فى 3 ايام عملنا شغل يتعمل فى اسبوع على الأقل ومش هيطلع النتايج دى. دى كانت الحلقه الأولى من التجربه البديعه دي والبقيه تأتى.